The short stretch before Grand Canal St Lower from Holles St to Grattan St has a surprising amount of history packed into it. Before its current name honouring Irish sculptor John Hogan (see below), it was called Wentworth Place, housing both Hogan and Irish painter George Sharp. And before that again, a map of the city from 1797 labels the entire length Artichoke Road. Although this was at the eastern outskirts of the city, some development along the initial stretch of this road is apparent on the 1797 map. One of these early buildings probably housed the man responsible for the first name of the street: Artichoke. In 1736, French refugee John Villiboise leased some land from Richard, 5th Viscount Fitzwilliam, and erected a “curiously designed house” there (Dawson, 1978). Villiboise grew artichokes in his garden, and his agricultural efforts led to both the road and the house taking on the appellation. According to Dawson in 1978, the site of The Artichoke house, then at 37 Wentworth Place, had been recently cleared, but people remembered it and used to call it “The Castle”. The street at this time was also home to the “factory and timber yard” of Robert Strahan & Co., a furnishing company established in 1776, located at No. 12, as can just be made out in the company’s advertisement. Strahan also made doll’s houses, and a house made about 1820 (“Strahan House”) was donated to the National Museum of Ireland (Raftery, 1985). 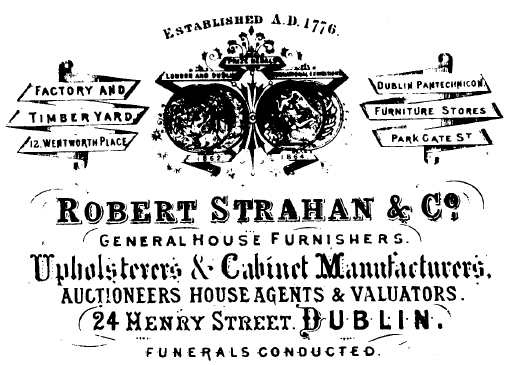 Some detail on Strahan’s furniture is available on the NMI website. The street obtained the name Wentworth Place in the 1830s, when a terrace of houses were built by John Swift Emerson, who likely obtained a lease from Charles Wentworth-Fitzwilliam, whose father had inherited both the Wentworth and Fitzwilliam fortunes. 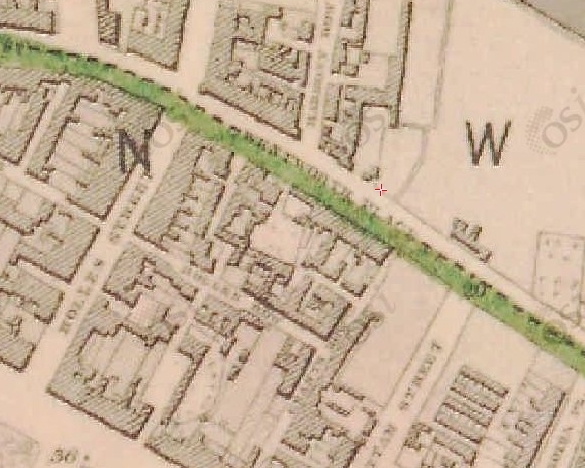 The OSi map from about 1838-1840 likely captures this new terrace, and shows the street name now as Wentworth Place. My interest in this street was piqued by Philip McEvansoneya’s recent article on George Sharp (2014). In it he writes that Sharp had set up a school in the late 1840s at Wentworth Place, with the help of his friend and mentor Sir Philip Crampton. In promoting his school, Sharp wrote that it was “the only school room for drawing established within the city of Dublin for 50 years“. McEvansoneya gives the address as 16 Wentworth Place, and indeed the street index of 1862 lists George Sharp, artist and professor of drawing, R.H.A. as resident there. Buildings either side are labelled “tenements”, but this must have been pretty decent accommodation for the time. Sharp had good connections to high society, and he counted Viscount Powerscourt and Sir Charles Coote among his patrons, and perhaps his pupils. This area near Pearse St would become a popular place for artists and architects (Casey, 2009) and Sharp was joined in 1862 by Lawrence Aungier (painter) and John Hogan (sculptor). Hogan lived at No. 14, which still exists, just about. It looks like it has been incorporated into the modern buildings to the west, where 10-13 have been rebuilt. Hogan was a sculptor, Waterford born, self-taught, and initially based in Cork. He moved to Rome in 1824 although returned to Ireland regularly to exhibit work and collect payment (Turpin, 1980). He returned to Ireland in 1849, settling at Wentworth Place. A lot of detail about Hogan’s work, and his many statues in Ireland are available at this website (McGreevy, 1943). These include his statue of O’Connell at City Hall, shown. Viscount Powerscourt must have enjoyed visiting Wentworth Place, as he was a patron of Hogan too, as was Lord Cloncurry. The latter commissioned Hibernia with a bust of Cloncurry (1846), which Turpin considers to be his masterpiece. It is available to view in the UCD Collection, and it shows Hibernia giving Cloncurry a delicate but affectionate little hug. Hogan died in 1858, but his family lived on in Wentworth Place. The 1901 Census lists three of his daughters: Margherita (aged 58) and Kate (Cattarina) (49), both born in Rome and both unmarried, and Susan McSwiney (née Hogan), a widow (40). It looks like the family moved from the original house at No. 14 though, as the address is given as “Wentworth Place South Side“. This may have been to distinguish them from another Hogan—James (52)—who also lived on the street. He is not, as far as I can make out, a brother, but is perhaps another relative. By 1911, only James’ wife Kate (now Catherine) was living on the street. The occupations of her children (domestic servant, van driver, shop assistant) suggest that if they were related to John Hogan, the family’s social status had fallen. 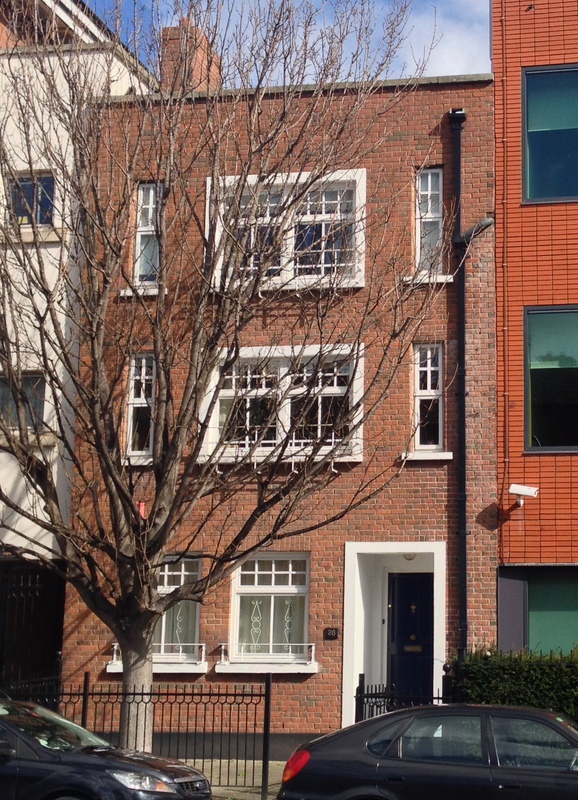 Whatever about the family’s fortunes, such was Hogan’s output, it was decided to rename Wentworth Place as Hogan Place in 1924. The Irish Times reported in May 1924, under a headline that made this author happy (“Dublin Street Names“), that along with changes to Sackville St., Queen’s Square, Great Clarence St., and Hamilton Row,* Wentworth Place was to be renamed as Hogan Place. The resolution was moved by Mr P McIntyre at Dublin Corporation, seconded by Mr Medlar, and with that, the new name was official. We won’t know until the release of the 1926 Census whether there were any descendants of Hogan still living in the eponymous street, but No. 14 must certainly be a candidate for a plaque to commemorate one of Ireland’s most prolific sculptors. *Changed to O’Connell St, Pearse Square, Macken St, Fenian St respectively. Dawson, T (1978) Some Echoes of “St. Catherine’s Bells”, Dublin Historical Record, 31(3), 82-93. McEvansoneya, P (2014) More Light on George Sharp (1802-1877), Irish Architectural and Decorative Studies, XVI, 50-69. MacGreevy, T (1943) Some Statues by John Hogan, The Father Matthew Record. 5-6. Raftery, C (1985) The Strahan Doll’s House, Irish Arts Review, 2(2), 33-35.